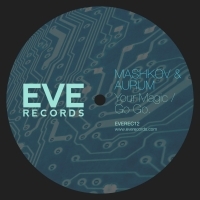 Dark, dingy and atmospheric - Mashkov and Aurum return to EVE Records with double single 'Your Magic' and 'Go Go'. 'Your Magic' combines the kind of infectious electronic sound that this duo are now renowned for, along with an ominous vocal sample which brings a depth to the progression of rhythm. In the second track 'Go Go', the duo head deeper down the rabbit hole with a grimy exploration of the dark side of grooves. 'Your Magic / Go Go' is available now from Beatport and iTunes.